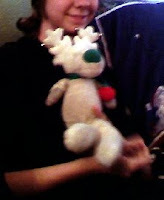 Picture of: the white reindeer, the very first gift given to my eldest daughter by my dad, her grandfather, 18 years ago. He still makes an appearance every Christmas. The reindeer makes a yearly appearance, I mean. My dad is here all year long. Yay! Today I: stayed off the grid. Family. Cooking. Party. So, blessings and peace to you in these days of Light in whatever manner you celebrate them.